François de Neuville Duke of Villeroy (1644-1730) is brought up with Louis XIV, who will remain his friend all his life. He took over the Regiment de Lyonnais from his father (1661-1683); appointed marshal of camp (1674) then lieutenant-general (1677), he succeeds his father with the Government of Lyonnais (1685). He gives the regiment of Lyonnais to his son Louis-Nicolas. While he had distinguished himself militarily as camp marshal or lieutenant general, he later demonstrated incompetence at the head of the armies. Named Marshal of France in 1693, he accumulated defeats. In Italy, he is beaten in Chiari and captured in Cremona; the support of Louis XIV makes him still the head of the army in the Netherlands: he is defeated by Marlborough at Ramillies (1706). He is then deprived of command, but then becomes by the testament of Louis XIV governor of the young Louis XV from 1717 to 1722; He is a member of the Regency Council and Chairman of the Finance Council. wonderful set of figures and the same to say about your painting work on the figures. I like it very much. and reminds me to continue to paint my own set. "Bonnart, Robert (1652-1729); French. Medium: engraving. Duc de Vendome (1654-1712) dit 'Le Grand Vendome'; Count of Penthievre; Comte; War of the Great Alliance; War of the Spanish Succession; Marechal; Marshal of France; Photo Giraudon 1936; N. Bonnart rue St Jacques a l'aigle; reign of Louis XIV (1638-1715); Provenance: Bibliotheque Nationale, Paris, France / Giraudon. Photographic Rights The Bridgeman Art Library." [ADDED] Fortunately Erd..-bay did not block the Encyclopaedia Britannica ! Louis-Joseph, duke de Vendôme, also called (until 1669) Duc De Penthièvre, (1654—1712), one of King Louis XIV’s leading generals during the War of the Spanish Succession (1701–14). Vendôme was the son of Louis de Vendôme, Duke de Mercoeur, by his marriage to Cardinal Jules Mazarin’s niece, Laure Mancini. Vendôme entered the French Army in 1672 and had risen to the rank of lieutenant general by the outbreak of the War of the Grand Alliance (1689–97) between France and the other major powers. He distinguished himself in the victory over the Allies at Steenkirke (1692) and was made commander in Catalonia in 1695; two years later he captured Barcelona. The dispute over the succession to the Spanish throne brought France and Spain to war with the British, the Austrians, and the Dutch in 1701. Appointed to the command in northern Italy in 1702, Vendôme fought the Austrian commander, Prince Eugene of Savoy, in the bloody but indecisive Battle of Luzzara on August 15. He took Vercelli in 1704 and defeated Prince Eugene at Cassano in August 1705. In May 1706 Vendôme was transferred to the Flanders front, where the British commander John Churchill, 1st Duke of Marlborough, had just won an overwhelming victory at Ramillies. 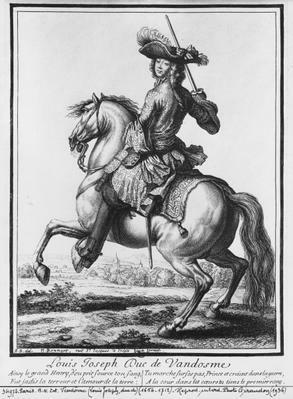 Vendôme made limited gains until he was severely defeated by Marlborough and Prince Eugene at Oudenaarde on July 11, 1708. Vendôme subsequently failed to relieve besieged Lille (in northern France), which fell to the Allies in October. Recalled by Louis XIV, he was temporarily disgraced. In the autumn of 1710, Vendôme was made commander of the army of King Philip V of Spain. He recaptured Madrid for Philip and on December 9 forced the British general James Stanhope to surrender at Brihuega. The next day he won a major victory over Guido von Starhemberg’s Austrian forces at Villaviciosa. As a result of these triumphs, Philip was assured of his throne, and the Austrians were confined to Catalonia. Vendôme was completing the reconquest of Catalonia when he died (58 years old). no, no, they are all amazing!!! Breathtaking is the word but certainly excessive ! Richard I hope you will say the same when youget yours !